A Patient Transfer Board is typically a rigid flat board constructed of plastic and is used to bridge two surfaces. Studies show that back injuries are the single most important workman’s compensation issue facing most hospitals. 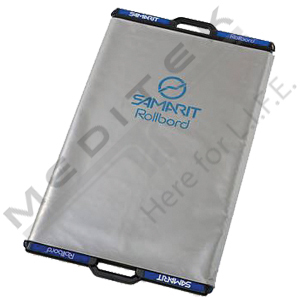 The Samarit Rollbord™ from Meditek is a safe, easy and secure way to transfer patients to avoid lifting when transferring patients. Samarit transfer boards are designed to simplify the transfer of patients, without the need for manual lifting, making the transfer safer for the caregiver and the patient. It acts like a tank track to allow the user to very easily and gently push patients across a gap between two surfaces. Staff will find it very easy to use and patients will appreciate it. Moving patients can result in injuries to patients and staff members. Lateral patient transfers from a stretcher to an OR table do pose a high risk for shoulder, back, and neck injuries for peri-operative personnel. Optional disposable covers are also available. Extremely hard-wearing, these transfer boards are suitable for excessive use and are also foldable so that they can be easily carried and stored. The nylon cloth that rolls around the central core is strong, robust and tear-resistant, as well as anti-bacterial and anti-fungal. Samarit patient transfer boards allow you to transfer your heaviest patients without lifting. Designed to act like a roller board, yet they are roller-free. Unique conveyor-belt action transports patient from surface to surface, with just by a gentle push. Patient Transfer Boards include carry handles for easy storage and hands-free transport. Transfer between surfaces of similar height. Or, transfer to a slightly lower surface. This reduces work for you and another caregiver. Keep yourself in correct position: feet flat on the floor, fingers away from potential pinch points. As you move across the board, stop and re-position your legs and feet as needed. Do this one leg at a time, keeping each foot aligned with the knee. Explain the steps of the move to the patient and always ask when he or she is ready to move. Use a gait belt to provide a firm hold, rather than clasping your hands behind the patient’s back. Practice first with assistance from a health care provider familiar with them. Remember, to bridge a gap between two lying surfaces and transfer a patient across from one to the other, use a Samarit transfer board! Hello. Thank you for your question, have emailed you the information and look forward to working with you. Best of luck!